Schaeffer continues to chronicle the subsequent philosophers who followed Kierkegaard’s thought including the atheistic existentialism of Karl Jaspers, Jean-Paul Sartre and Martin Heidegger. These men reasoned below the line of despair and gave up hope of a rational answer to the questions of life. The end result: they are left with only the anti-rational. Schaeffer proceeds to explain what he considers the further steps under the line of despair. The first as noted above began with philosophy. The second step was art. The third – music. The fourth – culture and the fifth step was the new theology which was opened by Karl Barth. While most refer to this brand of theology as “liberal” or “neo-orthodox,” and rightly so, the issue at hand runs deeper than labels. Indeed, liberal theology rejects the deity of Christ, the inerrancy of Scripture and the New Testament miracles. The new theology knows nothing of man being created in the image of God. But Schaeffer adds further clarity to the issue: “All the new theology and mysticism is nothing more than a faith contrary to rationality, deprived of content and incapable of contentful communication. You can bear ‘witness’ to it, but you cannot discuss it. Rationality and faith are out of contact with each other” (The God Who Is There, 64). The consequences and despair of modern man can be found in three areas. Falling prey to nihilism or embracing a worldview that offers no hope. Schaeffer enhances his discussion by contrasting the Christian faith with modern man’s faith which has turned inward. In Christianity, the value of faith depends upon the object towards which the faith is directed. So it looks outward to the God who is there, and to the Christ who in history died upon the cross once for all, finished the work of atonement, and on the third day rose again in space and in time. This makes the Christian faith open to discussion and verification (The God Who Is There, 65). In 1948, after a ten year pastorate in the United States, he moved his family to Switzerland to engage in missionary work. In 1955, Dr. and Mrs. Schaeffer founded L’Abri in a small mountain village in Switzerland. French for “shelter,” L’Abri became a refuge for people in need of spiritual help. 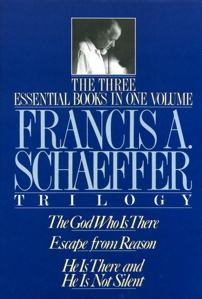 The Schaeffers were especially interested in people who sought answers to basic philosophical and metaphysical problems. He writes, “To the best of my ability I gave the Bible’s answers. But all the time I tried to listen and learn the thought forms of these people. I think that my knowledge, whatever it is, is formed from two factors: 1) Forty years of hard study, and 2) Trying to listen to the twentieth century man as he talked” (Eternity, March 1973). Schaeffer’s keen ability to listen carefully and engage the intellect of these people became a primary factor that contributed to his success. Students came to L’Abri from varied backgrounds – philosophy, medicine, architecture, science and theology. The Schaeffers ministered to college professors, students, pastors, engineers and lawyers to name a few. The common thread among all L’Abri visitors was a thirst for truth. These people sought answers to the basic questions of life: Who am I? Where am I going? What is my purpose in life? How does God fit in the scheme of things?